My "love letter" to Sepp Blatter, to the tune of Jay Z's "Dear Summer". This was the best World Cup competition I can remember. It was a spectacle filled so many highs and lows. The Colombian and Belgium national teams established themselves as future contenders with a fast, flowing style of soccer that thrilled everyone. The people of Brazil, however, did not deserve such a tragic outcome. They were such gracious hosts to the whole world, and their smiles and good vibes belied their team's atrocious performances on the pitch. This may not have been the strongest Brazilian national team, but I don't think any pundit could have predicted that they wouldn't even show up. Home field advantage and individual quality was not enough to paper over Amazon-sized holes in this "squad," and I use that term lightly. Neymar is world class, but his striking partners Jo and Fred don't inspire fear in any defense. Ronaldinho may be a fading star, but he can still decide a game with a clever pass; 10-15 minutes is all it would have taken for him to conjure up some magic. But that moment has passed, as has the whole Brazilian system, and they have gone back at least 10 years in terms of world-beating quality. Italy's Andrea Pirlo and Germany's Miroslav Klose bowed out with a grace many should learn from. When Italy were on form, they played offense as if they were performing a puppet show, Pirlo playing a modern-day Geppetto pulling the strings. Klose leaves the German national team as top scorer in the history of the World Cup, usurping the original (Brazilian) Ronaldo. FIFA, for a month you made everyone feel like they were part of something so much bigger. I never felt that I were watching the game alone. Whole nations stopped to hold their breath, to hope, to yell and compel a team forward or back. Every fan was a blade of glass on the pitch, swaying back and forth; sometimes trampled by a player's cleat, sometimes springing a player's movement forward. But this is not about Brazil, or Germany, or Colombia. This is about the future. Even I got caught up in it here. Nice trick, FIFA. The next two World Cups are scheduled to be held in Russia and then Qatar. There has been an outcry to change the host nations for these events. Right now, Russia is embroiled in a civil war in Ukraine. Russia's leader, Vladimir Putin, has become a volatile megalomaniac whose next move is hard to predict. Qatar will build majestic new stadiums for the World Cup. The problem is that Amnesty International has reported that the workers building these stadiums are treated like slaves. They come to Qatar from South Asia, promised lucrative jobs. When they get there, their passports are taken away so they cannot return and they are housed and treated inhumanely. It's 120 degrees F. Are you ready for some football? The Qatar World Cup is scheduled to be played in the summer. Then there is the whole bribery scandal. It has been alleged that votes in favor of a Qatari World Cup were bought. There have been calls to redo the vote. Who is calling for it? Not a rogue Football Association mad at not getting to host the competition or outraged fans. One of the World Cup's biggest sponsors, Sony, is demanding that FIFA stand by "its principles of integrity, ethics and fair play." In true FIFA fashion, the investigation into vote buying is "semi-independent' and results of the investigation will be private. C'mon son. 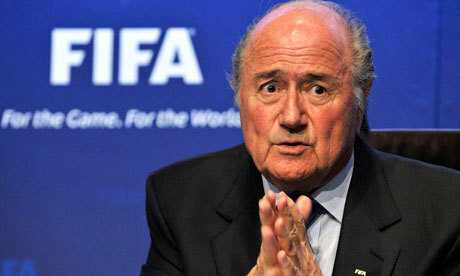 Sepp, as president of FIFA, you have a chance to bow out gracefully. Pressure from FIFA may not stop Putin's grasp at his own version of Manifest Destiny, but a few well-placed words about the atmosphere at World Cup 2018 would do wonders for how FIFA is perceived. Admit Qatar 2022 was a mistake and allow another vote to happen. It's tugging at my heart but this time apart, until 2018, is needed. Listen here, FIFA baby, I just believe it's the right thing to do. I have to swipe the app up. The EPL, Serie A, and La Liga will be in action very soon. Like all good things, we must come to an end, dear FIFA.